The Cold Springs Lady Eagles traveled to Huntsville Thursday for two North Regional Tournament matchups, first with the Ider Lady Hornets, and later with Lamar County. 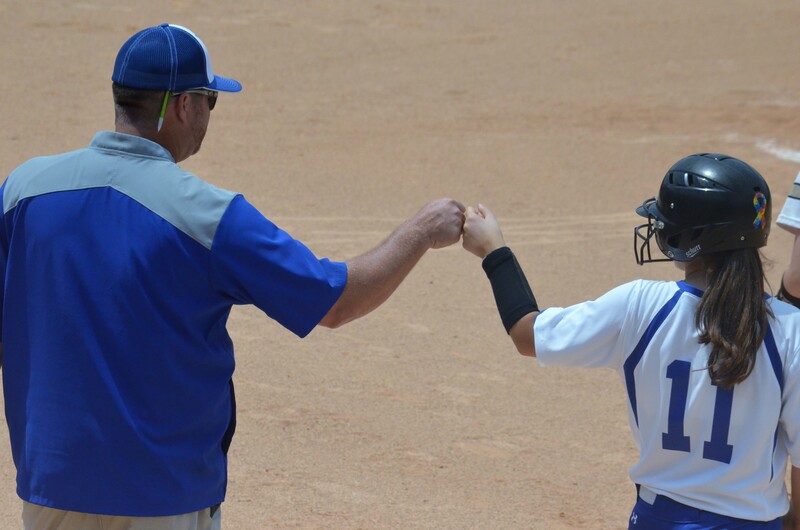 Cold Springs lost its first game of the day to the Lady Hornets, 5-0. Starting pitcher Drew Sanders put together a solid, complete game performance, but the Lady Eagles couldn’t generate enough offense to put the pressure on Ider. The Lady Hornets quickly scored two in the top of the first to take an early lead but after that, Sanders held Ider scoreless for the next five innings. Despite Sanders’ efficiency on the mound, Cold Springs was only unable to come up with five hits in the game and couldn’t push any runs across the plate. Sanders went all seven innings, allowing four earned runs on seven hits and picking up a strikeout in the loss. Lacy Rice led the way offensively for the Lady Eagles, going 2-for-3 at the plate. Crimson Gann, Morgan Chasteen, Hayden Goodwin and Anna Kate Voce each finished with a hit for Cold Springs as well. The Lady Hornets pulled away for good in the top of the seventh where they scored three runs on an error, an RBI single and a sacrifice fly and got three quicks out in the bottom of the inning to take the game, 5-0. In their second game of the day, the Lady Eagles faced Lamar County in an elimination game. Sanders got the start on the hill again for Cold Springs and faced a tougher challenge in the Lady Bulldogs’ lineup. Lamar County knocked off the Lady Eagles 12-2, ending Cold Springs’ tournament run and season at 22-12. Sanders finished 3-for-4 at the plate with an RBI double and Kylon Hamby was effective in the box as well, finishing 2-for-3 with a double of her own. The Lady Bulldogs struck early with an RBI single and a bases-clearing double in the top of the first to go up 4-0. Sanders began chipping away at the Lamar County lead with an RBI double in the bottom of the third and Voce followed her up with a sacrifice fly RBI that cut the lead to 4-2. Lamar County added two more in the fourth with a two-RBI single, and after keeping Cold Springs’ bats quiet for the next two innings, put the game away in the sixth. A solo homerun put the Lady Bulldogs up 7-2 to start the inning, and a two-run shot that put them up 9-2 came just a few pitches later. Lamar County made it 10-2 with another run in the sixth and added two more in the seventh to secure the 12-2 win. The loss eliminates the Cold Springs Lady Eagles from post-season contention and wraps up a strong season at 22-12 overall. The West Point Lady Warriors, runners-up in Class 5A, Area 12, looked to keep their season alive as this season marked the fourth time in five years they qualified for the Regionals. They got started on the right foot. Gracie Abbott reached on a dropped fly ball by the second baseman, Rylee Hiett, to lead off the game. A strikeout later, Molly Pendley lined an RBI double to center field to put the Lady Warriors on the scoreboard. Cleburne County, though, countered in the bottom of the second. After West Point starter Carlie Wilkins put up a zero in the bottom of the first, she quickly ran into trouble in the second. She walked Gracie Sanders to lead off the inning, then Hiett reached on an error by catcher Hope Shedd. The Lady Tigers tied the game at one on an RBI single, then another error loaded the bases. Three consecutive singles plated four Cleburne County runs to push the Lady Warrior deficit to four at 5-1. Both pitchers pitched a scoreless third inning, then West Point struck back with a big inning in the fourth. Makayla Brown got hit by the pitch to lead off the inning, then she took second on a wild pitch. Shedd drew a walk after that, then Braelee Quinn struck out and Brown got picked off at second. Bethany Minck, the courtesy runner for Shedd, stole second and advanced to third on a Wilkins single to right field. During the play, an error by the right fielder, Sanders, allowed Minck to score to make it a 5-2 game. After Josey Gammon drew a walk, Avery McClure lined an RBI double to right field, then Abbott tied the game with a two-run double. An Olivia Ball single led to the center fielder making an error on the play, which allowed Abbott to score on the play to give the Lady Warriors a 6-5 lead. The Lady Tigers tied the game in their half. Kaylee Shierling led off the inning with a triple to right field. A little later in the inning, an error by third baseman Pendley allowed Shierling to tie the game at six, and they took the lead in the bottom of the fifth. A single and two walks loaded the bases, and with two outs, Madison Higgins drew a walk to give Cleburne County a 7-6 lead. After the Lady Warriors put up a zero in the run column in the top of the sixth, they had one more chance to tie the game or take the lead. Pendley led off the inning with a double to left field, then she moved to third as Brown reached on an infield single. A Shedd groundout moved Brown over to second with just one out. But they couldn't push the tying and go-ahead runs across as Quinn struck out and Wilkins grounded out. McClure (run scored) and Pendley each finished with two hits and an RBI for West Point. Abbott added a hit, two runs scored and two RBIs in the game. Wilkins collected two hits and a run scored. Quinn and Ball each chipped in with a hit of their own. Minck and Lexi Kimbril each scored a run in the game. West Point's season was on the line in their loser's bracket game against Pleasant Grove later in the day. The Lady Warriors got something going to start off the game. Pendley hit a one-out single to left field, then an out later, Brown and Shedd drew back-to-back walks to load the bases for Wilkins, who looked to put the Lady Warriors on the scoreboard first, but she popped out to the catcher to end the inning. The Lady Spartans took advantage of a West Point error to tie the game at one on an RBI single in their half. After both teams put up zeros for the next three-and-a-half innings, the Lady Warriors finally got their offense going in the top of the fifth. Abbott led off the inning with a walk, then Pendley tied the game at one on an RBI double. The next two innings, West Point was unable to scratch across a run. Then the Lady Spartans took advantage, big-time, of a pair of Lady Warrior errors; the last one led to the game-winning run for Pleasant Grove and West Point saw its season come to a stunning end with the 2-1 loss. Pendley finished with a pair of hits and an RBI for the Lady Warriors. Abbott (one run scored), Wilkins and McClure each added a hit in the game. The Lady Warriors finish the season with a 13-19-2 record. West Point will lose four seniors to graduation later this month: McClure, Shedd, Gammon and Chasilyn Morrow. Addison will play South Lamar on Friday at 10:30 a.m. Previous articleGet your fix at Southern Mix!